HAMPSTEAD star Kingsley Osuigwe has netted the chance of a lifetime after being invited to play for the Birmingham City Youth Academy. The towering defender, pictured far left with his Hampstead teammates, will be looking to showcase his talents when he lines up for the Midlands club next Saturday against Tottenham. 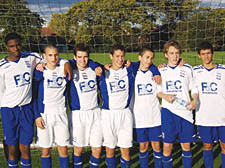 Originally seven of Hampstead’s Under-16s players were taken on trial at the Premier League club, with Ahmed Elkhasassi, James Dabbs, Benji Gavron, Emilio Benavides-Hazelton, Ciaran Prendeville and Marko Popovic all impressing coaches with their silky skills. Although six of the players have not yet been invited back, they will continue to hit the headlines as they look to clinch a league and cup double in the Premier Division of the Harrow Youth League.